Following a second-place finish at the Cornell Invitational Sept. 21-22 in Ithaca, N.Y., the Drexel golf team came in 17th at the Wolfpack Invitational Oct. 6-8 hosted by North Carolina State University. Christoper Crawford finished tied for 40th place individually. 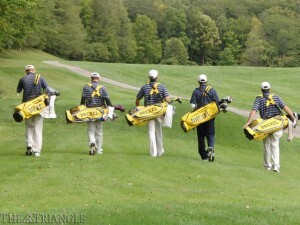 Amid a difficult course layout and challenging weather conditions, the Drexel men’s golf team turned in a solid showing at the 2013 Wolfpack Intercollegiate, finishing in 17th place. The Dragons were led by a strong performance from sophomore Christopher Crawford, who turned in a team-low score of 223 for the three rounds of play and finished tied for 40th place overall in a field of 90 golfers. With winds gusting over 20 miles per hour and the tees playing back, the Dragons had to overcome the challenges of a dark, rainy morning as they approached the first round of play Oct. 7 for an 8 a.m. shotgun start on the Lonnie Poole Golf Course in Raleigh, N.C. Following 36 holes of competition on the first day, the Dragons sat in 17th place. After a slow start in the first round, the team picked up the broken pieces and posted a 303 on the scorecard, recording their best round of the tournament. In the final round, the team seemed to be having trouble adjusting to the southern terrain of the 7,358-yard course. Crawford was especially able to overcome the obstacles that this strenuous course had to offer, as he led the way after an inconsistent first round of play. In the second round, Crawford looked like he was settling in as he shot a mistake-free back nine with three birdies, carding an even-par round of 72. Still, his final score of 223 was 20 shots behind tournament champion Carter Jenkins of The University of North Carolina at Greensboro. Freshman Yoseph Dance was not far behind his teammate, tying for 56th place in the field with a score of 226. Dance showed promise early on in the tournament as he buried a spectacular 70-foot putt on the sixth hole of the first round. If that wasn’t enough, he made another lengthy birdie putt only three holes later to close out the front nine. Sophomore Alex Kane wrapped things up for the Blue and Gold, tied for 77th place with a final score of 234 over the three rounds. Kane’s tournament was highlighted by a final-round birdie on the very first hole. He also sunk a putt after a nice approach on a troublesome par-5. The toughest hole of the course seemed to be the dreaded No. 18. This 482-yard par-4 was giving golfers trouble the entire tournament. This problematic hole averaged 0.71 strokes over par for the 90 participants. But Crawford, Dance and Kane seemed to weather the storm of the finishing hole, as they collectively shot 4 over par on the 18th hole. After a demanding tournament at the challenging Lonnie Poole Golf Course, the Dragons can feel the weight being lifted off their shoulders as they eye their next competition. They wrap up their fall season when they head back to North Carolina Oct. 20-22 for the ODU/OBX Invitational. Look for the battle-tested Dragons to improve upon their last performance on a much more manageable golf course at the Kilmarlic Golf Club in Powells Point, N.C.